Why I Read this Book: The Iron King was a book that I was initially going to pass on. I’m not much into faeries, so even though I’ve seen this book on the internets it hadn’t made it onto my TBR list. But then, with the recent release of The Iron Queen, the buzz was circulating around the blogosphere and the buzz was good. Good buzz from trusted fellow book bloggers = spot on my TBR list. 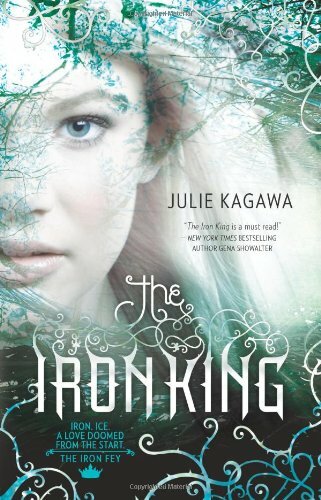 What I Liked: The Iron King is told in 1st person narrative from Meghan’s POV. The author did a great job with this; there wasn’t too much thinking or over-analyzing like you sometimes get with 1st person narrative. I enjoyed the journey from Meghan’s standpoint because she’s a likable character who has her priorities in order (especially for being only 16 years old). I also liked Grimalkin; he humored me. And the attention to detail in the world created by the author is phenomenal. She has created this unique world, and the unique creatures to go along with it. There is a lot going on in the storyline. A new character or dilemma shows up with every chapter. And although there was a lot going on, it was not overwhelming; it was enough to keep me engaged and moving along with a peaked curiosity. There was never a dull moment. The book overall is aesthetically pleasing. Not only is the cover nice to look at but I love the attention to detail at the beginning of each chapter and at each sectional (i.e. ‘Part I’, ‘Part II’, ‘Part III’) in the book. And the title, The Iron King, was not as obvious as I had first thought. I also like that the book first came out in trade paperback. Hardcover editions are a bit pricier and I like the size of a trade paperback. What I Didn’t Like: There were inconsistencies, several of them. I’ll list a few – I’m going to be as vague as possible to avoid spoilers. I’ll include page numbers for those who would like to refer to the book for more details. Meghan says it's the first time Ash has called her by name (p. 285). Um, no. He called you by name 2 pages ago (p. 283). Overall Impression: The Iron King was lacking in some areas and flourished in others. The inconsistencies really got me. That said, I still enjoyed the story and I look forward to reading the rest of the series. The Iron King is a good start to the series but there’s room for improvement. The book left off at an interesting point and I’m curious to see what happens next. Fans of Alice in Wonderland will enjoy the reference and the similarities found in this book. There’s also a bit of A Midsummer’s Night Dream added to the mix so if you’re a Shakespeare fan, this book will appeal to you as well. For those who have read this book (and/or the series to date), you may be wondering which team I’m on. As of right now, I’m on Team Pash – meaning I’m on both Team Puck and Team Ash. I see potential in both guys. Maybe I’ll side with one after reading the next book. I can't believe I missed those inconsistencies but I did! I think I was so wowed by the imagery that I overlooked some of that. I'm glad you liked this one and the subsequent books are even better. Team Pash---I love it!!! That was a great review. I read this a while ago and enjoyed it too. I really like that you pointed out the inconsistencies and I agree that they can drive you crazy. Whoa! I totally overlooked those inconsistencies, too. Thanks for including page numbers, now I'm curious to actively go and seek them out. I do remember being annoyed that Ash and Meghan didn't listen to Grimalkin's plan. It seemed an obvious plot device to separate the group so that Ash and Meghan could 'fall in love'. But overall, I really enjoyed the story; glad you did too. This book was all over the blogosphere last year and now again because of the sequel. Nice review, I am still not sold, it is out of my norm.